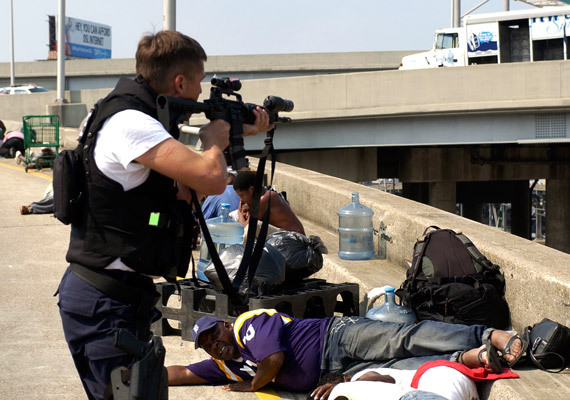 In the chaotic days after Hurricane Katrina, an order circulated among New Orleans police authorizing officers to shoot looters, according to present and former members of the department. It's not clear how broadly the order was communicated. Some officers who heard it say they refused to carry it out. Others say they understood it as a fundamental change in the standards on deadly force, which allow police to fire only to protect themselves or others from what appears to be an imminent physical threat. The accounts of orders to "shoot looters," "take back the city," or "do what you have to do" are fragmentary. It remains unclear who originated them or whether they were heard by any of the officers involved in shooting 11 civilians in the days after Katrina. Thus far, no officers implicated in shootings have used the order as an explanation for their actions. Only one of the people shot by police – Henry Glover – was allegedly stealing goods at the time he was shot. Still, current and former officers said the police orders – taken together with tough talk from top public officials broadcast over the airwaves -- contributed to an atmosphere of confusion about how much force could be used to combat looting. In one instance captured on a grainy videotape shot by a member of the force, a police captain relayed the instructions at morning roll call to cops preparing for the day's patrols. "We have authority by martial law to shoot looters," Captain James Scott told a few dozen officers in a portion of the tape viewed by reporters. Scott, then the commander of the 1st district, is now captain of the special operations division. Another police captain, Harry Mendoza, told federal prosecutors last month that he was ordered by Warren Riley, then the department's second-in-command, to "take the city back and shoot looters." A lieutenant who worked for Mendoza, Mike Cahn III, said he remembered the scene similarly and would testify about it under oath if asked. Mendoza and Cahn said in separate interviews that Riley made the remarks at a meeting at Harrah's casino, where police had established a command post. Mendoza quoted Riley as saying: "If you can sleep with it, do it," according to a document prepared by prosecutors and provided to lawyers defending police officers recently charged with federal offenses. Riley categorically denied telling officers they could shoot looters. "I didn't say anything like that. I heard rumors that someone else said that. But I certainly didn't say that, no." "I may have said we need to take control of the city," Riley said. "That may have happened."